My internal sound card died, and I decided to give this a try. The first thing I noticed was the headphones that seemed to have no bass were great. Plenty of volume. Software for customizing more would be nice, but for the quality it produces is not really needed. (5 stars) Small with Big Features! 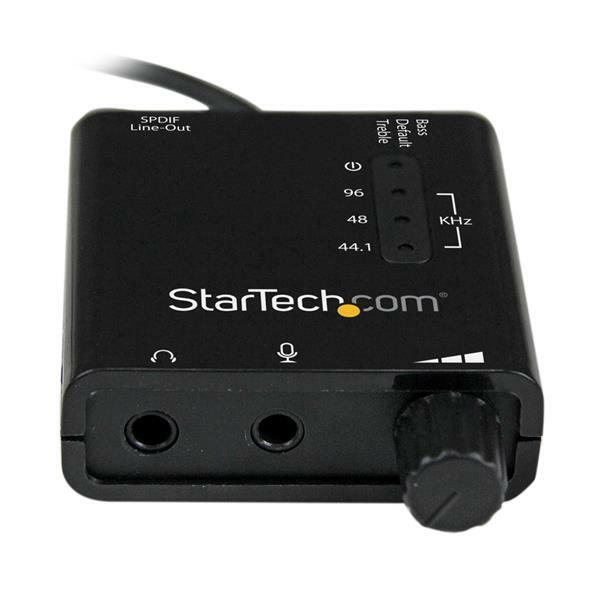 This is a very small (it surprised me, I thought it would be a lot bigger) external USB sound card with lets you have great sound for both headphones and for normal cheap microphones (more so than if you connect them to your microphone in on your motherboard sound card (or any internal sound cards I've ever tried). If you need great sound for your PC or laptop and you're on a budget (and even if you're not on a budget), this is the one for you. I run a tri-amp system that predominantly plays all channel stereo from my .flac library. I am most definitely an audiophile and there is certainly a SQ improvement using this device. I have a 3.5mm spdif to optical audio hooked straight to amp 1 as opposed to laptop media port (? Is that what it's called) to HDMI to TV then optical out to amp 1. I recommend setting the main volume to 85% player at 100% then adjust amps from there. Last night I set up Dolby Atmos for headphones free trial plugin, enabled 7.1 virtual surround and hooked my velodyne cans to this device. I was blown away with the AC3-encoded Valerian and the city of 1000 planets swarming around the headphones. 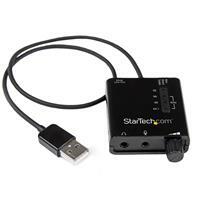 Top notch product, startech. Hurry up and make an android app/plugin so I can enjoy my .flacs on my LG g5 with neutron! Also, send me some devices to review on my blog. You guys rock! I had trouble getting it to work with Windows 10 Pro x64, but after using chat in StarTech support, the tech used a remote admin program that worked better than TeamViewer 12 (which I use often to help friends). The whole ordeal, from first contact to end was less than 10 minutes and it's working great (and no longer generically). I think the problem was that I ran the setup.exe file in the root folder, which failed, then device manager / update driver / point to (again) root with "check subfolders" which usually works for everything, but neither worked. The tech did the dev. mgr / update driver thing, but pointed directly to "Vista x64" instead.. I think it was grabbing an XP driver when I let it choose for itself. If anyone has this problem, try pointing to Vista x64 before calling the tech. Either that or I had a corrupt .zip, although I watched the tech download the very same file I did. Either way, the sound quality is far superior to the MB.. (ASRock Killer Fatal1ty 990FX) which has a pretty decent card built in to begin with. Best $30 I spent in a while. Now to plug in my Audio-Technica HD headphones! 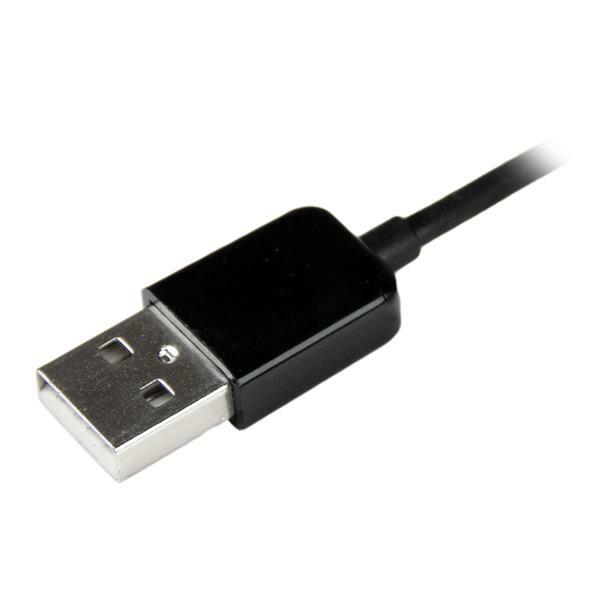 I purchased this adapter a month or so ago with the primary goal of getting an optical output out of my Windows 10 PC. It works like a charm. Obviously, I was looking to get high quality output. This too was delivered. This seems like a great product but I get an error when I try to install on my windows 10 laptop. Because I cannot install the driver, I have to plug in the device then plug headphones into it in order to hear any sound. Wish they would update for windows 10. 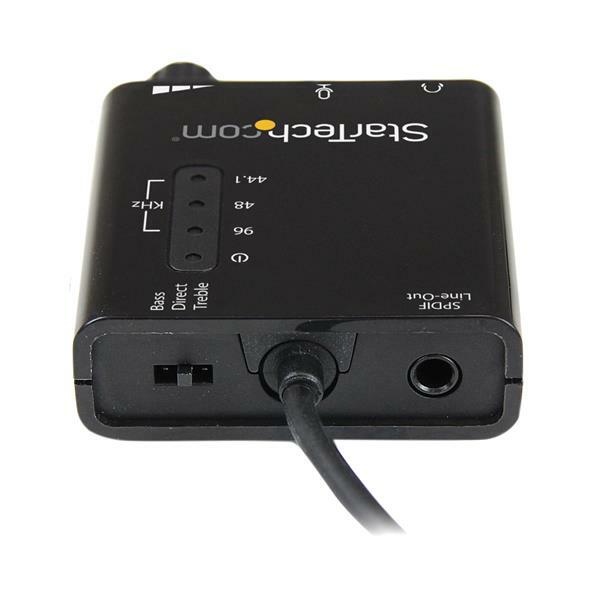 I had bought two new laptops running Windows 10 both, however, only had a single audio socket for a headset and not proper stereo line inputs. As a result when trying to record my old LP records I would get prominent tick, tick, tick sounds with the music quietly underneath it. 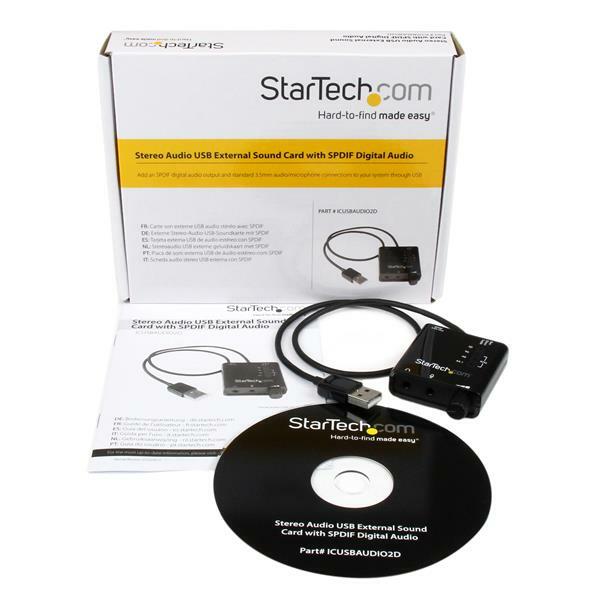 I eventually found and ordered a StarTech Stereo Audio USB External Sound Card with SPDIF Digital Audio. After a bit of changing inputs and setting the input as a USB microphone and output as the laptop's normal speakers the sound is perfect again. The search was not easy as I didn't really know what to look for - many USB adapters are not stereo, and this is. I got mine from Span.com as I'm in the UK.